What does labeled for reuse mean? I read this article and found it very interesting, thought it might be something for you. The article is called What does labeled for reuse mean? and is located at http://www.onehourprofessor.com/what-does-labeled-for-reuse-mean/. » What does labeled for reuse mean? One of the most common problems that I see when people start their own website or online business is that they end up becoming a thief. The amazing thing about this is how widespread the issue is and every single day I’m confident that there are thousands of people that steal without knowing that they are doing so. In fact, I’ll admit that when I first started my own website I ended up doing the same thing and only found out months later that it was inappropriate and frankly, illegal. So, what is it that people are stealing? Images, just like music and film, have usage rights. Meaning, you have to have the right to use the work in order to put it on your website. The way I see it, there are two ways to explain what labeled for reuse means. 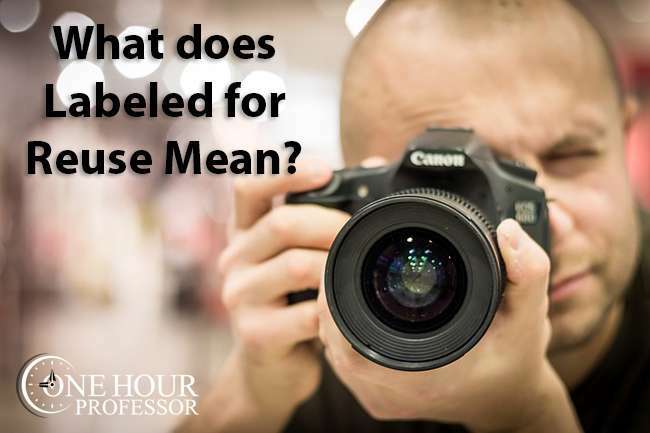 1) The official explanation that most websites use: Labeled for reuse means that individuals can take a photo and reuse it commercially, or non-commercially, as it is. 2) A simpler explanation: As an individual, you are able to use these photos in any way that you’d like whether they be for commercial purposes such as your own website, or noncommercial purposes such as a school project. In other words, if an image is labeled for reuse it means that you can use it however you want, wherever you want, without modifying anything and that’s okay. As an example, if you found a photo that was “labeled for reuse”, you could take that image and put it on your website without having to worry about any possible legal repercussions. For those that think it’s highly unlikely that there will be any legal action against them for using images that are not supposed to be shared, I recommend that you check out my other blog post which outlines how Getty images has made substantial profit off of small business owners who unknowingly steal website images. Trust me when I say that you can be prosecuted for taking images directly off of Google, Getty Images in particular has some very advanced technology that finds those images and will ask you to prove that you purchase them. If you can’t prove that you own it, you’ll have to pay a pretty hefty fine of about $1,000 per image. Just make sure that whatever images you use are labeled for reuse and you’ll be in the clear. One thing to mention which is important is that you should always give attribution to the original author if you use a image for your website. This isn’t required most of the time, but how would you feel if somebody took image you photographed and put it on their website without giving you credit? This is more of a moral dilemma, but I assure you that these photographers appreciate when you do this. Where can I get website images? There are plenty of places to get images on the Internet. I remember when I first started out I was stressing about how I could find website images because my content looked so bland without it. If you need really high quality images, I highly recommend that you use Shutterstock. The reality is that free images only go so far and eventually you may need a really nice picture for the homepage or other key pages on your website. This is the exact same company that I use for my really high quality images and I’ve joined their affiliate program because I know that this is a company who has great images at a very low cost compared to competitors. Your post is highly confusing – First you say that images marked as ‘for re-use’ CAN be used in any form for commercial or non-commercial purposes. Then you say that we can be prosecuted for it. Please be clear about this. Else this article is as confusing as the topic it is trying to describe. Great write up! I know Google has a search option where I can choose labeled for reuse. But then when I click to open the photo preview it says may be subject to copyright. This is confusing. Do you have nay knowledge on that one? Is this mean that, corporation can’t use labelled for reuse in theirs commercial projects? Looks like your youtube video on how to use google analytics to rank for a keyword phrase worked because you are on the first position! Hey, I’m wondering about putting these images that are labelled for reuse on t-shirts to sell? I have a number of cartoons. I want to post them, so people can find them in Google under “labeled for reuse” (with attribution to my website), but not “labeled for reuse with modification”. You have any idea to which image site I can upload my images, to get this label with Google? @ConffusedByThisArticle: if you have not figured it out already by now, I would like to point out the example they make in the article is about Getty Images looking for their images, which would not be ones labeled for reuse, and not the ones that are. That is the key to that part of the article. It is not clear without reading closely to the perspective in the new paragraph. A transition statement at the beginning of that paragraph would have been helpful. But, it is not contradictory actually. Labeled for Reuse means you can freely use them as long as you do not modify them. and Labeled for Reuse with Modification means you can modify them as well. Good explanation of the reuse situation. Might be time for an update, google have changed some of the phrases they use to describe the usage rights now.